Download "CITY OF KELOWNA. BYLAW NO. 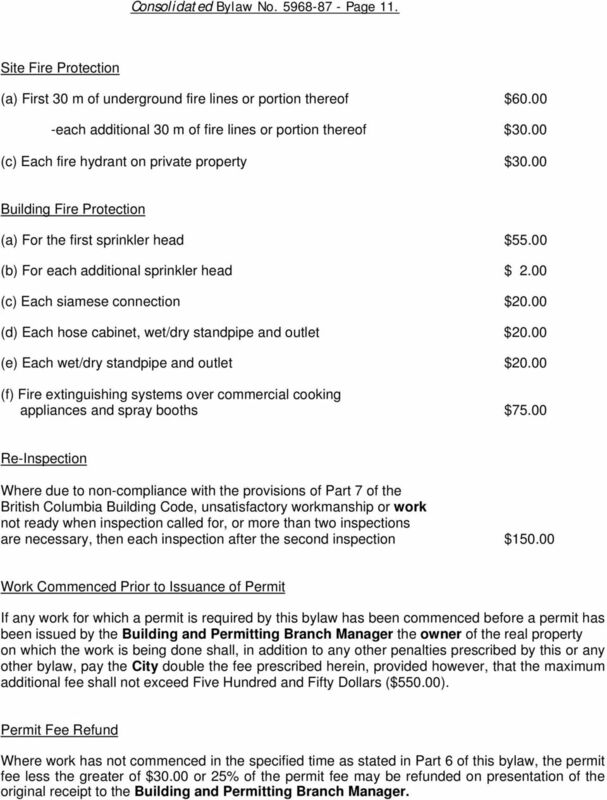 5968-87 REVISED: November 28, 2011"
1 SUMMARY: The Plumbing Regulation Bylaw sets out the permits and inspections required when constructing, altering or repairing plumbing systems within City limits. It also sets out standards for site drainage, water service lines, installation of plumbing fixtures and the installation of water meters. This bylaw is a 'consolidated' version and includes amendments up to the date listed in the bylaw heading. It is placed on the Internet for convenience only, is not the official or legal version, and should not be used in place of certified copies which can be obtained through the Office of the City Clerk at City Hall. Plans, pictures, other graphics or text in the legal version may be missing or altered in this electronic version. 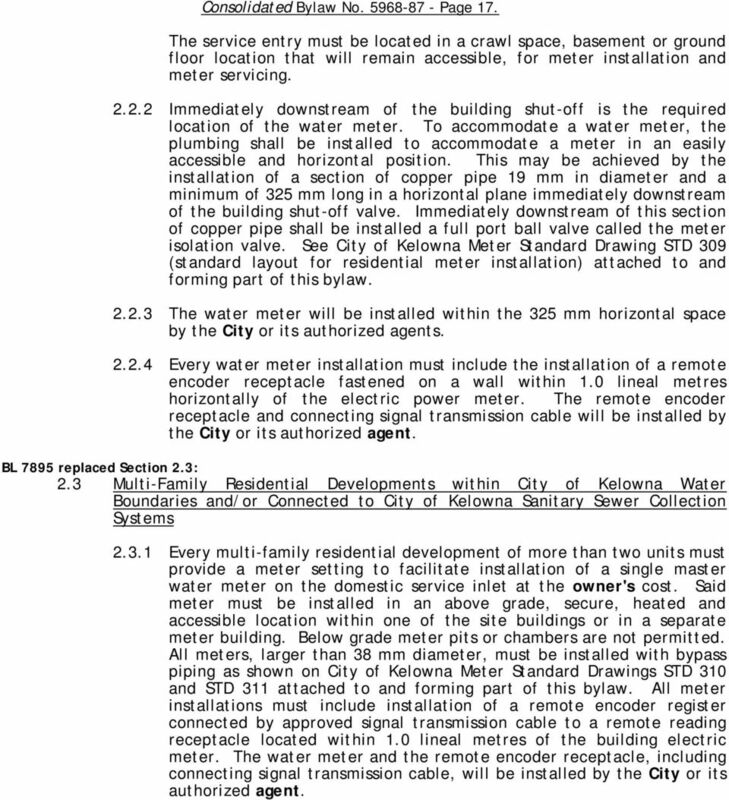 2 CITY OF KELOWNA BYLAW NO REVISED: November 28, 2011 CONSOLIDATED FOR CONVENIENCE TO INCLUDE BYLAW NOS. 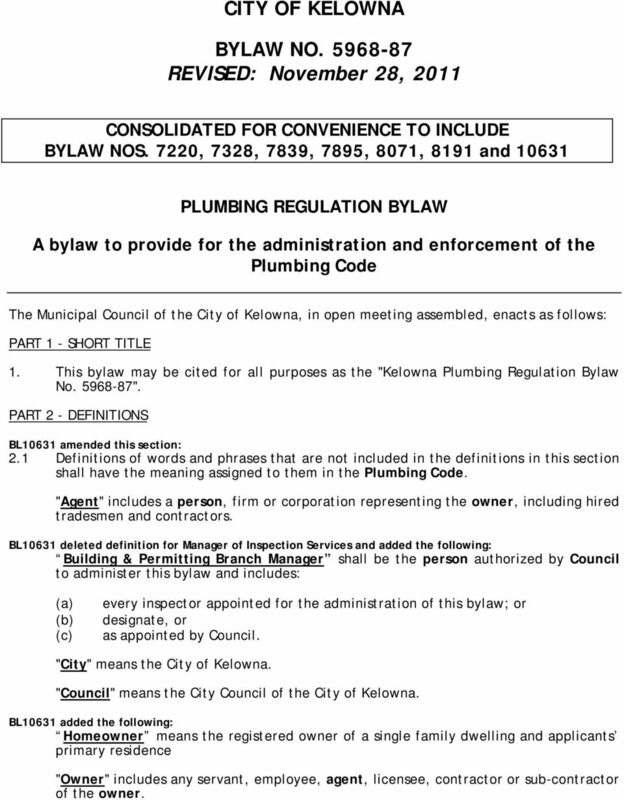 7220, 7328, 7839, 7895, 8071, 8191 and PLUMBING REGULATION BYLAW A bylaw to provide for the administration and enforcement of the Plumbing Code The Municipal Council of the City of Kelowna, in open meeting assembled, enacts as follows: PART 1 - SHORT TITLE 1. 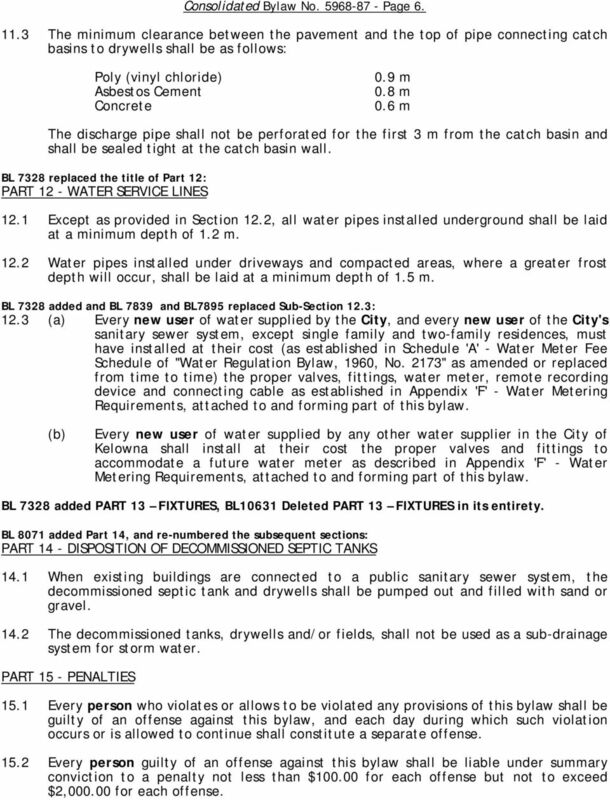 This bylaw may be cited for all purposes as the "Kelowna Plumbing Regulation Bylaw No ". 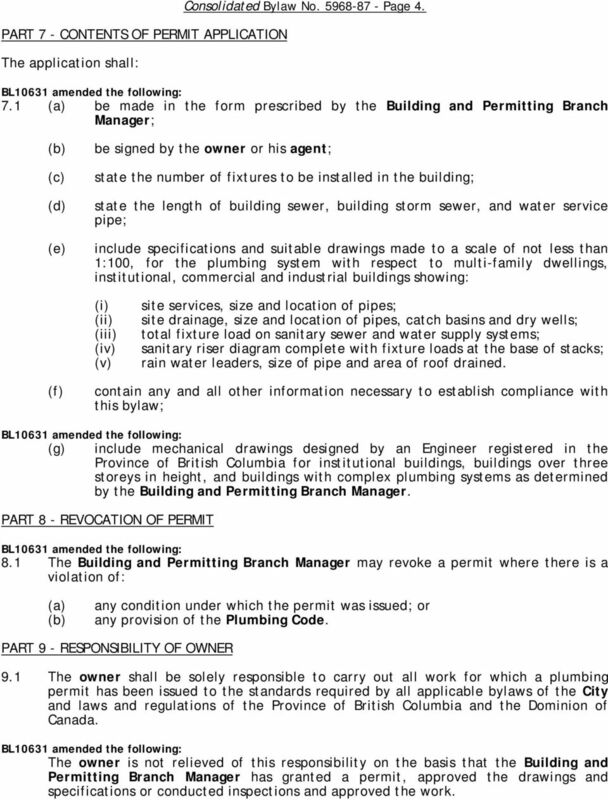 PART 2 - DEFINITIONS BL10631 amended this section: 2.1 Definitions of words and phrases that are not included in the definitions in this section shall have the meaning assigned to them in the Plumbing Code. "Agent" includes a person, firm or corporation representing the owner, including hired tradesmen and contractors. BL10631 deleted definition for Manager of Inspection Services and added the following: Building & Permitting Branch Manager shall be the person authorized by Council to administer this bylaw and includes: (a) (b) (c) every inspector appointed for the administration of this bylaw; or designate, or as appointed by Council. "City" means the City of Kelowna. "Council" means the City Council of the City of Kelowna. BL10631 added the following: Homeowner means the registered owner of a single family dwelling and applicants primary residence "Owner" includes any servant, employee, agent, licensee, contractor or sub-contractor of the owner. 3 Consolidated Bylaw No Page 2. "Plumbing Code" means any regulation with respect to plumbing made by the Lieutenant Governor in Council under Section 740 of the Municipal Act. "Person" means and includes any Corporation, partnership, association, society or party. BL 7328 added the following definition: "New User" means any use made through a new connection to any water system after the adoption of Bylaw 7328, Amendment No. 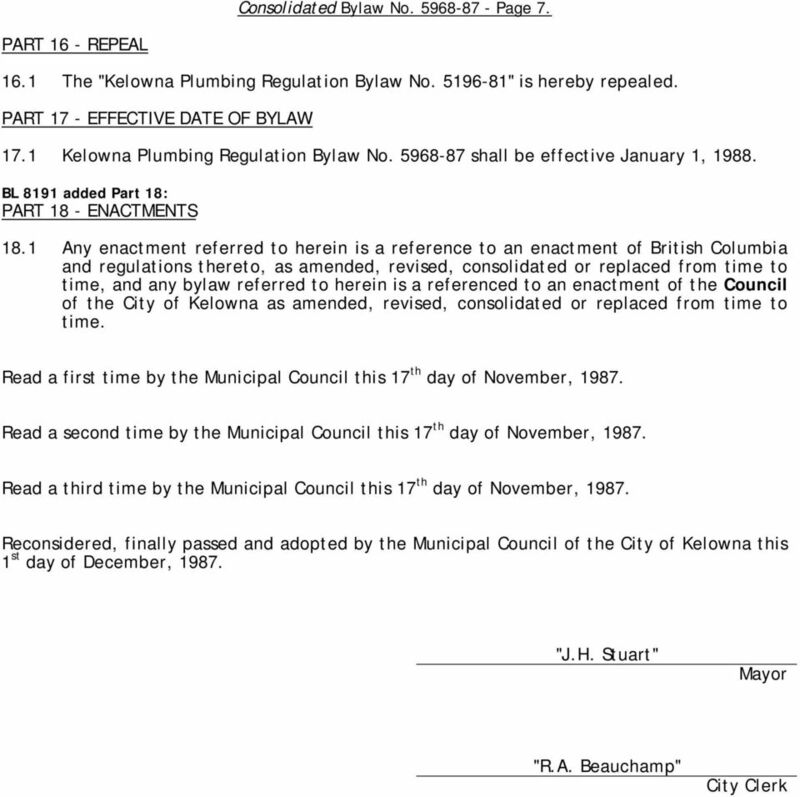 2 to Kelowna Plumbing Regulation Bylaw No PART 3 - PROHIBITIONS 3.1 No person shall construct, alter, renew or repair a plumbing system unless he holds a valid and subsisting permit authorizing such work by the Building and Permitting Branch Manager. 3.2 No person shall, unless authorized by the Building and Permitting Branch Manager, reverse, alter, deface, cover, remove, or in any way tamper with any notice or certificate posted on or fixed to any building or plumbing system, pursuant to any of the provisions of this bylaw. 3.3 No person shall do any work that is at variance with the description, plans and specifications for the plumbing system, work or thing for which a permit has been issued, unless such change has first been approved in writing by the Building and Permitting Branch Manager. 3.4 No person shall interfere with, or obstruct the entry of the Building and Permitting Branch Manager onto land or premises as authorized by the provisions of this bylaw. 3.5 No person shall continue to do any work upon a plumbing system, or any portion thereof after the Building and Permitting Branch Manager has ordered cessation of work thereon. 3.6 No person shall cause, suffer or permit the disposal of sewage, human excrement, or liquid wastes in any place or manner, except through and by means of an approved system. 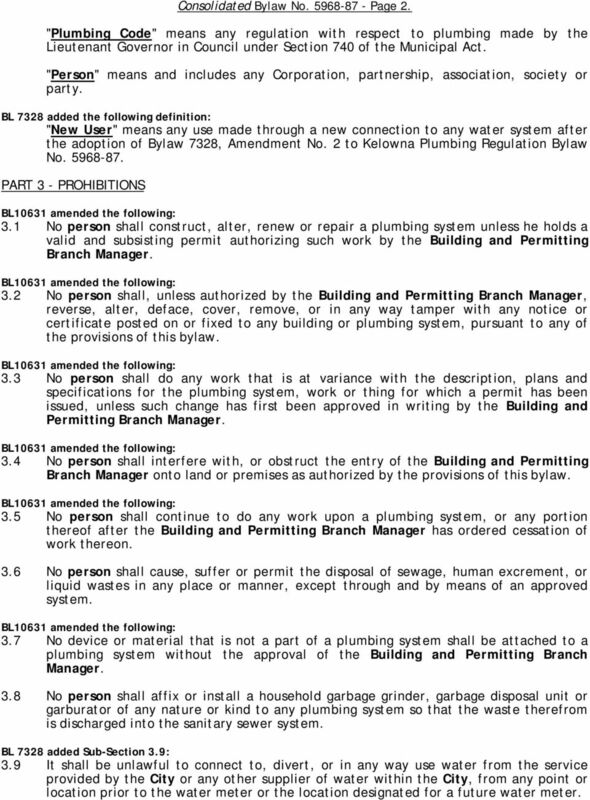 3.7 No device or material that is not a part of a plumbing system shall be attached to a plumbing system without the approval of the Building and Permitting Branch Manager. 3.8 No person shall affix or install a household garbage grinder, garbage disposal unit or garburator of any nature or kind to any plumbing system so that the waste therefrom is discharged into the sanitary sewer system. BL 7328 added Sub-Section 3.9: 3.9 It shall be unlawful to connect to, divert, or in any way use water from the service provided by the City or any other supplier of water within the City, from any point or location prior to the water meter or the location designated for a future water meter. 4 Consolidated Bylaw No Page 3. 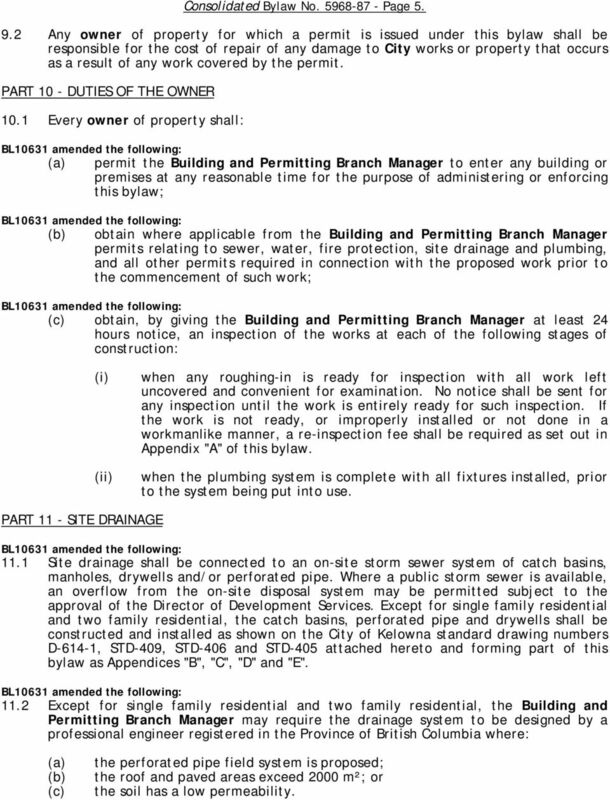 PART 4 - POWERS OF MANAGER OF INSPECTION SERVICES The Building and Permitting Branch Manager is hereby empowered to: 4.1 Administer this bylaw. 4.2 Keep records of any application received, permits and orders issued, inspection and tests made, and shall retain copies of all papers and documents connected with the administration of this bylaw. 4.3 Take such action as he may deem necessary in order to establish whether any method of installation or material used in the installation of any plumbing system conforms with the requirements and provisions of the Plumbing Code. 4.4 Enter at all reasonable times, upon any property, in order to ascertain whether the provisions of this bylaw are being obeyed. 4.5 Order the correction of any work which is being or has been improperly done under this bylaw or any permit issued pursuant to this bylaw. 4.6 Order the cessation of work that is proceeding in contravention of this bylaw or any permit issued pursuant to this bylaw. PART 5 - ISSUANCE OF PERMIT 5.1 The Building and Permitting Branch Manager shall issue a permit for which the application is made where: (a) (b) the proposed work set out in the application conforms with this bylaw and all other applicable bylaws; and the applicant has paid to the City of Kelowna the fee prescribed for a permit, as set out in Appendix "A" attached hereto and forming part of this bylaw. 5.2 No permit shall be required for the clearing of stoppage or repairing of leaks in pipes, valves or fixtures, when such repairs do not involve or require the replacement or rearrangement of valves, pipes or fixtures or hot water tanks. PART 6 - PERMIT CONDITIONS 6.1 Every permit is issued upon the following conditions: (a) (b) (c) that the work is to be started within six months from the date of issuing the permit; that the work is not to be discontinued or suspended for a period of more than one year; and that the permit shall lapse in the event that either condition described in 6.1(a) and 6.1(b) are not met. 5 PART 7 - CONTENTS OF PERMIT APPLICATION The application shall: Consolidated Bylaw No Page (a) be made in the form prescribed by the Building and Permitting Branch Manager; (b) (c) (d) (e) be signed by the owner or his agent; state the number of fixtures to be installed in the building; state the length of building sewer, building storm sewer, and water service pipe; include specifications and suitable drawings made to a scale of not less than 1:100, for the plumbing system with respect to multi-family dwellings, institutional, commercial and industrial buildings showing: (i) (ii) (iii) (iv) (v) site services, size and location of pipes; site drainage, size and location of pipes, catch basins and dry wells; total fixture load on sanitary sewer and water supply systems; sanitary riser diagram complete with fixture loads at the base of stacks; rain water leaders, size of pipe and area of roof drained. 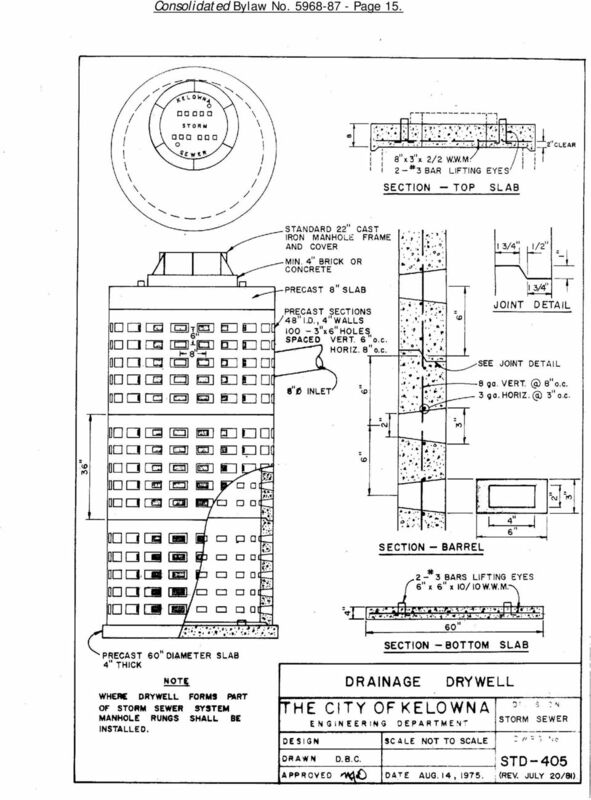 (f) contain any and all other information necessary to establish compliance with this bylaw; (g) include mechanical drawings designed by an Engineer registered in the Province of British Columbia for institutional buildings, buildings over three storeys in height, and buildings with complex plumbing systems as determined by the Building and Permitting Branch Manager. 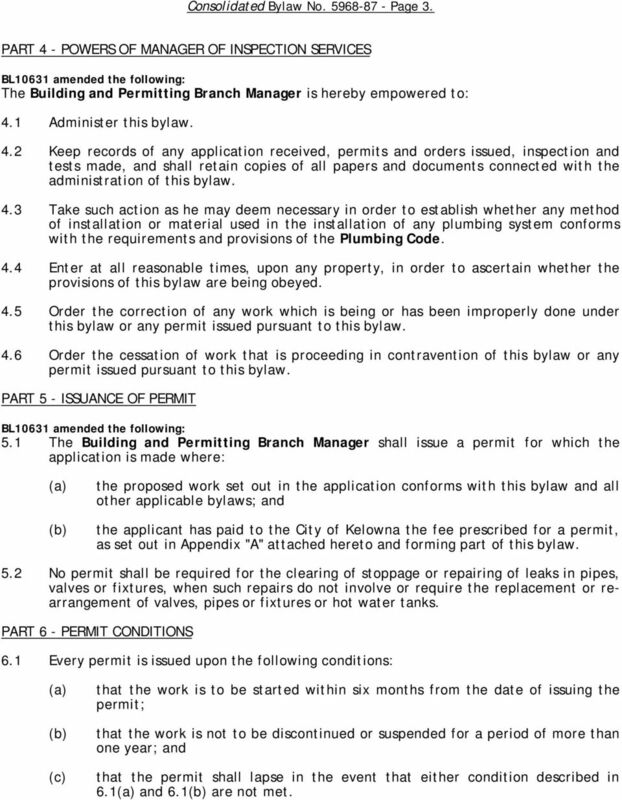 PART 8 - REVOCATION OF PERMIT 8.1 The Building and Permitting Branch Manager may revoke a permit where there is a violation of: (a) (b) any condition under which the permit was issued; or any provision of the Plumbing Code. PART 9 - RESPONSIBILITY OF OWNER 9.1 The owner shall be solely responsible to carry out all work for which a plumbing permit has been issued to the standards required by all applicable bylaws of the City and laws and regulations of the Province of British Columbia and the Dominion of Canada. The owner is not relieved of this responsibility on the basis that the Building and Permitting Branch Manager has granted a permit, approved the drawings and specifications or conducted inspections and approved the work. 6 Consolidated Bylaw No Page Any owner of property for which a permit is issued under this bylaw shall be responsible for the cost of repair of any damage to City works or property that occurs as a result of any work covered by the permit. PART 10 - DUTIES OF THE OWNER 10.1 Every owner of property shall: (a) permit the Building and Permitting Branch Manager to enter any building or premises at any reasonable time for the purpose of administering or enforcing this bylaw; (b) obtain where applicable from the Building and Permitting Branch Manager permits relating to sewer, water, fire protection, site drainage and plumbing, and all other permits required in connection with the proposed work prior to the commencement of such work; (c) obtain, by giving the Building and Permitting Branch Manager at least 24 hours notice, an inspection of the works at each of the following stages of construction: (i) (ii) when any roughing-in is ready for inspection with all work left uncovered and convenient for examination. No notice shall be sent for any inspection until the work is entirely ready for such inspection. If the work is not ready, or improperly installed or not done in a workmanlike manner, a re-inspection fee shall be required as set out in Appendix "A" of this bylaw. when the plumbing system is complete with all fixtures installed, prior to the system being put into use. PART 11 - SITE DRAINAGE 11.1 Site drainage shall be connected to an on-site storm sewer system of catch basins, manholes, drywells and/or perforated pipe. Where a public storm sewer is available, an overflow from the on-site disposal system may be permitted subject to the approval of the Director of Development Services. 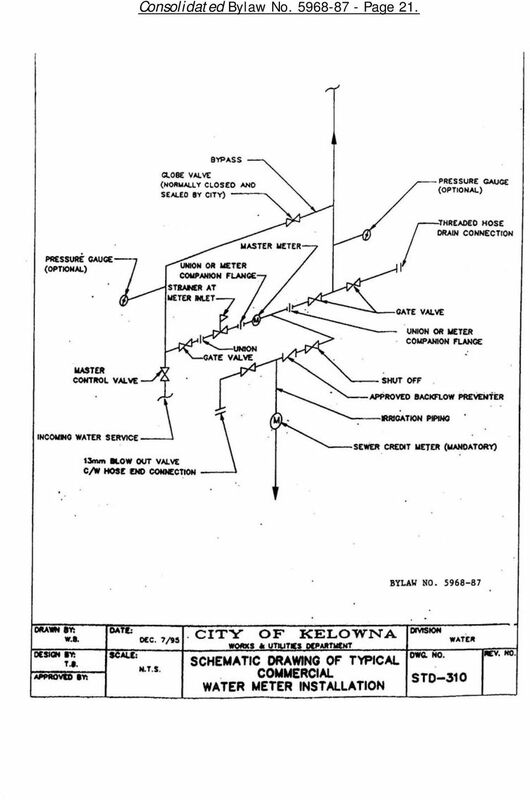 Except for single family residential and two family residential, the catch basins, perforated pipe and drywells shall be constructed and installed as shown on the City of Kelowna standard drawing numbers D-614-1, STD-409, STD-406 and STD-405 attached hereto and forming part of this bylaw as Appendices "B", "C", "D" and "E" Except for single family residential and two family residential, the Building and Permitting Branch Manager may require the drainage system to be designed by a professional engineer registered in the Province of British Columbia where: (a) (b) (c) the perforated pipe field system is proposed; the roof and paved areas exceed 2000 m²; or the soil has a low permeability. 7 Consolidated Bylaw No Page The minimum clearance between the pavement and the top of pipe connecting catch basins to drywells shall be as follows: Poly (vinyl chloride) Asbestos Cement Concrete 0.9 m 0.8 m 0.6 m The discharge pipe shall not be perforated for the first 3 m from the catch basin and shall be sealed tight at the catch basin wall. BL 7328 replaced the title of Part 12: PART 12 - WATER SERVICE LINES 12.1 Except as provided in Section 12.2, all water pipes installed underground shall be laid at a minimum depth of 1.2 m Water pipes installed under driveways and compacted areas, where a greater frost depth will occur, shall be laid at a minimum depth of 1.5 m. BL 7328 added and BL 7839 and BL7895 replaced Sub-Section 12.3: 12.3 (a) Every new user of water supplied by the City, and every new user of the City's sanitary sewer system, except single family and two-family residences, must have installed at their cost (as established in Schedule 'A' - Water Meter Fee Schedule of "Water Regulation Bylaw, 1960, No. 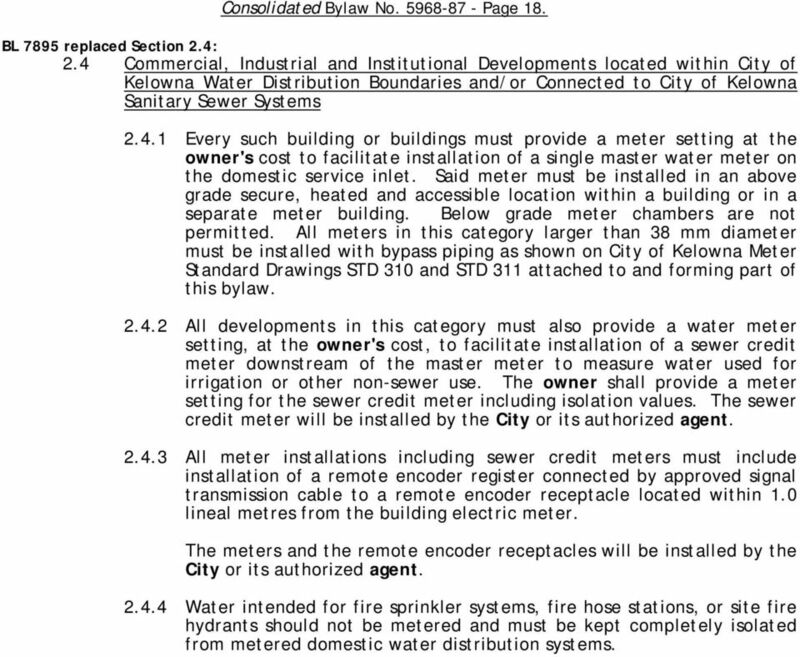 2173" as amended or replaced from time to time) the proper valves, fittings, water meter, remote recording device and connecting cable as established in Appendix 'F' - Water Metering Requirements, attached to and forming part of this bylaw. 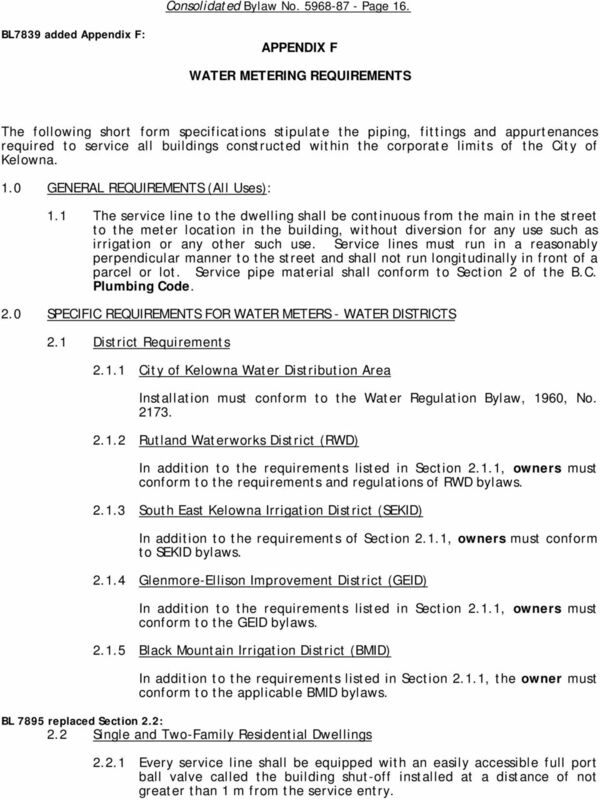 (b) Every new user of water supplied by any other water supplier in the City of Kelowna shall install at their cost the proper valves and fittings to accommodate a future water meter as described in Appendix 'F' - Water Metering Requirements, attached to and forming part of this bylaw. BL 7328 added PART 13 FIXTURES, BL10631 Deleted PART 13 FIXTURES in its entirety. 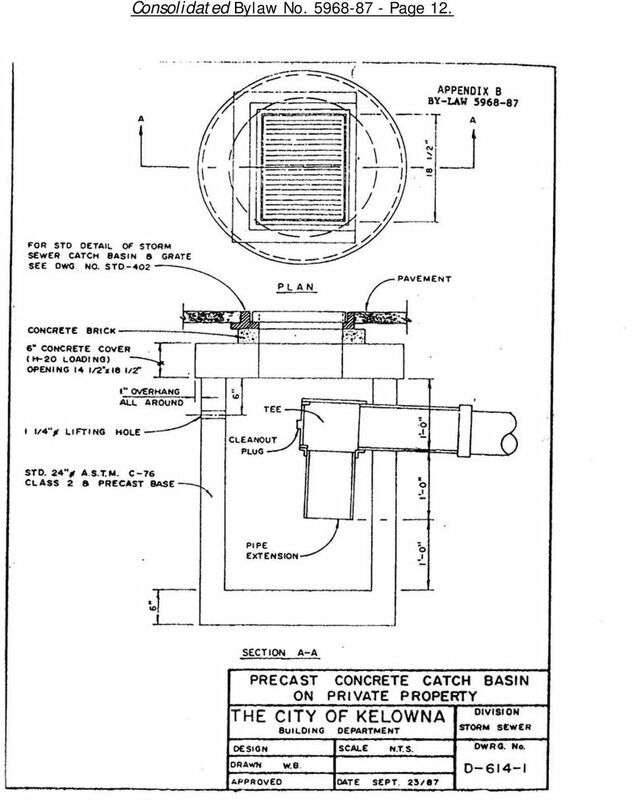 BL 8071 added Part 14, and re-numbered the subsequent sections: PART 14 - DISPOSITION OF DECOMMISSIONED SEPTIC TANKS 14.1 When existing buildings are connected to a public sanitary sewer system, the decommissioned septic tank and drywells shall be pumped out and filled with sand or gravel The decommissioned tanks, drywells and/or fields, shall not be used as a sub-drainage system for storm water. PART 15 - PENALTIES 15.1 Every person who violates or allows to be violated any provisions of this bylaw shall be guilty of an offense against this bylaw, and each day during which such violation occurs or is allowed to continue shall constitute a separate offense Every person guilty of an offense against this bylaw shall be liable under summary conviction to a penalty not less than $ for each offense but not to exceed $2, for each offense. 10 Consolidated Bylaw No Page 11. 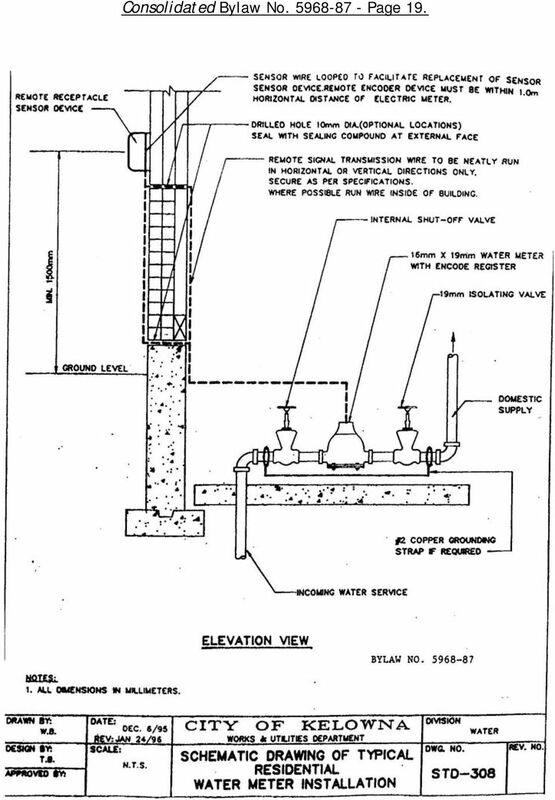 Site Fire Protection (a) First 30 m of underground fire lines or portion thereof $ each additional 30 m of fire lines or portion thereof $30.00 (c) Each fire hydrant on private property $30.00 Building Fire Protection (a) For the first sprinkler head $55.00 (b) For each additional sprinkler head $ 2.00 (c) Each siamese connection $20.00 (d) Each hose cabinet, wet/dry standpipe and outlet $20.00 (e) Each wet/dry standpipe and outlet $20.00 (f) Fire extinguishing systems over commercial cooking appliances and spray booths $75.00 Re-Inspection Where due to non-compliance with the provisions of Part 7 of the British Columbia Building Code, unsatisfactory workmanship or work not ready when inspection called for, or more than two inspections are necessary, then each inspection after the second inspection $ Work Commenced Prior to Issuance of Permit If any work for which a permit is required by this bylaw has been commenced before a permit has been issued by the Building and Permitting Branch Manager the owner of the real property on which the work is being done shall, in addition to any other penalties prescribed by this or any other bylaw, pay the City double the fee prescribed herein, provided however, that the maximum additional fee shall not exceed Five Hundred and Fifty Dollars ($550.00). Permit Fee Refund Where work has not commenced in the specified time as stated in Part 6 of this bylaw, the permit fee less the greater of $30.00 or 25% of the permit fee may be refunded on presentation of the original receipt to the Building and Permitting Branch Manager. 11 Consolidated Bylaw No Page 12. 12 Consolidated Bylaw No Page 13. 13 Consolidated Bylaw No Page 14. 14 Consolidated Bylaw No Page 15. 15 Consolidated Bylaw No Page 16. 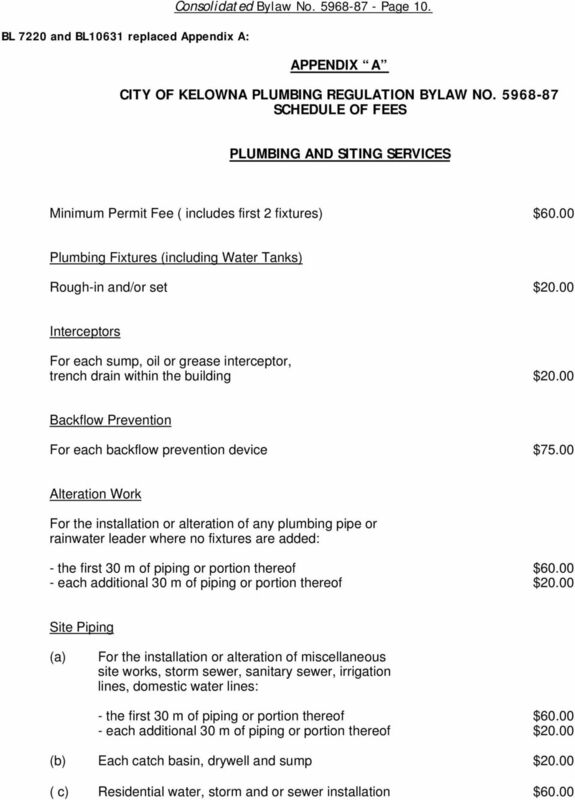 BL7839 added Appendix F: APPENDIX F WATER METERING REQUIREMENTS The following short form specifications stipulate the piping, fittings and appurtenances required to service all buildings constructed within the corporate limits of the City of Kelowna. 1.0 GENERAL REQUIREMENTS (All Uses): 1.1 The service line to the dwelling shall be continuous from the main in the street to the meter location in the building, without diversion for any use such as irrigation or any other such use. Service lines must run in a reasonably perpendicular manner to the street and shall not run longitudinally in front of a parcel or lot. Service pipe material shall conform to Section 2 of the B.C. Plumbing Code. 2.0 SPECIFIC REQUIREMENTS FOR WATER METERS - WATER DISTRICTS 2.1 District Requirements City of Kelowna Water Distribution Area Installation must conform to the Water Regulation Bylaw, 1960, No Rutland Waterworks District (RWD) In addition to the requirements listed in Section 2.1.1, owners must conform to the requirements and regulations of RWD bylaws South East Kelowna Irrigation District (SEKID) In addition to the requirements of Section 2.1.1, owners must conform to SEKID bylaws Glenmore-Ellison Improvement District (GEID) In addition to the requirements listed in Section 2.1.1, owners must conform to the GEID bylaws Black Mountain Irrigation District (BMID) In addition to the requirements listed in Section 2.1.1, the owner must conform to the applicable BMID bylaws. BL 7895 replaced Section 2.2: 2.2 Single and Two-Family Residential Dwellings Every service line shall be equipped with an easily accessible full port ball valve called the building shut-off installed at a distance of not greater than 1 m from the service entry. 16 Consolidated Bylaw No Page 17. The service entry must be located in a crawl space, basement or ground floor location that will remain accessible, for meter installation and meter servicing Immediately downstream of the building shut-off is the required location of the water meter. To accommodate a water meter, the plumbing shall be installed to accommodate a meter in an easily accessible and horizontal position. This may be achieved by the installation of a section of copper pipe 19 mm in diameter and a minimum of 325 mm long in a horizontal plane immediately downstream of the building shut-off valve. Immediately downstream of this section of copper pipe shall be installed a full port ball valve called the meter isolation valve. See City of Kelowna Meter Standard Drawing STD 309 (standard layout for residential meter installation) attached to and forming part of this bylaw The water meter will be installed within the 325 mm horizontal space by the City or its authorized agents Every water meter installation must include the installation of a remote encoder receptacle fastened on a wall within 1.0 lineal metres horizontally of the electric power meter. The remote encoder receptacle and connecting signal transmission cable will be installed by the City or its authorized agent. BL 7895 replaced Section 2.3: 2.3 Multi-Family Residential Developments within City of Kelowna Water Boundaries and/or Connected to City of Kelowna Sanitary Sewer Collection Systems Every multi-family residential development of more than two units must provide a meter setting to facilitate installation of a single master water meter on the domestic service inlet at the owner's cost. Said meter must be installed in an above grade, secure, heated and accessible location within one of the site buildings or in a separate meter building. Below grade meter pits or chambers are not permitted. 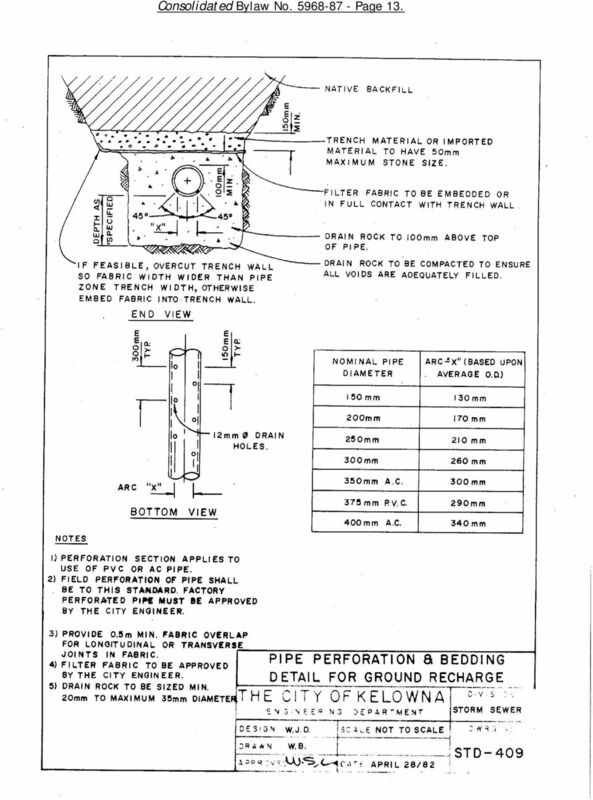 All meters, larger than 38 mm diameter, must be installed with bypass piping as shown on City of Kelowna Meter Standard Drawings STD 310 and STD 311 attached to and forming part of this bylaw. All meter installations must include installation of a remote encoder register connected by approved signal transmission cable to a remote reading receptacle located within 1.0 lineal metres of the building electric meter. The water meter and the remote encoder receptacle, including connecting signal transmission cable, will be installed by the City or its authorized agent. 17 Consolidated Bylaw No Page 18. BL 7895 replaced Section 2.4: 2.4 Commercial, Industrial and Institutional Developments located within City of Kelowna Water Distribution Boundaries and/or Connected to City of Kelowna Sanitary Sewer Systems Every such building or buildings must provide a meter setting at the owner's cost to facilitate installation of a single master water meter on the domestic service inlet. Said meter must be installed in an above grade secure, heated and accessible location within a building or in a separate meter building. Below grade meter chambers are not permitted. All meters in this category larger than 38 mm diameter must be installed with bypass piping as shown on City of Kelowna Meter Standard Drawings STD 310 and STD 311 attached to and forming part of this bylaw All developments in this category must also provide a water meter setting, at the owner's cost, to facilitate installation of a sewer credit meter downstream of the master meter to measure water used for irrigation or other non-sewer use. 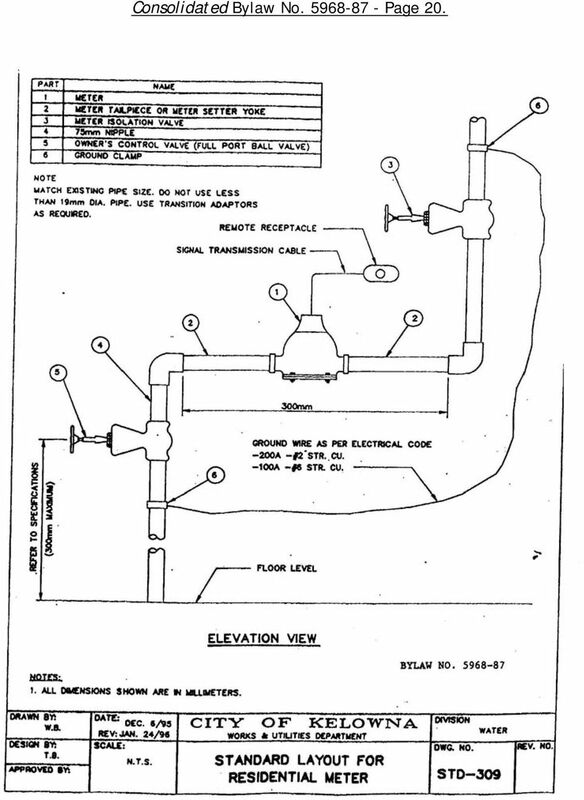 The owner shall provide a meter setting for the sewer credit meter including isolation values. The sewer credit meter will be installed by the City or its authorized agent All meter installations including sewer credit meters must include installation of a remote encoder register connected by approved signal transmission cable to a remote encoder receptacle located within 1.0 lineal metres from the building electric meter. The meters and the remote encoder receptacles will be installed by the City or its authorized agent Water intended for fire sprinkler systems, fire hose stations, or site fire hydrants should not be metered and must be kept completely isolated from metered domestic water distribution systems. 18 Consolidated Bylaw No Page 19. 19 Consolidated Bylaw No Page 20. 20 Consolidated Bylaw No Page 21. 21 Consolidated Bylaw No Page 22. PLEASE NOTE This document, prepared by the Legislative Counsel Office, is an office consolidation of this regulation, current to June 1, 2014. It is intended for information and reference purposes only. 87-21. Definitions; contractors licensed by Board; examination; posting license, etc. This Program is made Possible through the Code Officials Education & Training Fund. Revenue for the Fund comes from Assessments on Building Permits. Please turn down cell phones and put pagers on vibrate. DIVISION 695 Hist. : DC 2-1983, f. & ef. 1-3-83; Renumbered from 814-020- PLUMBING LICENSING AND CERTIFICATION 0040; BCD 6-1998, f. 3-2-98, cert. ef. 4-1-98, Renumbered from 918-690-0055; BCD 21-1998, f.
ORDINANCE NO. 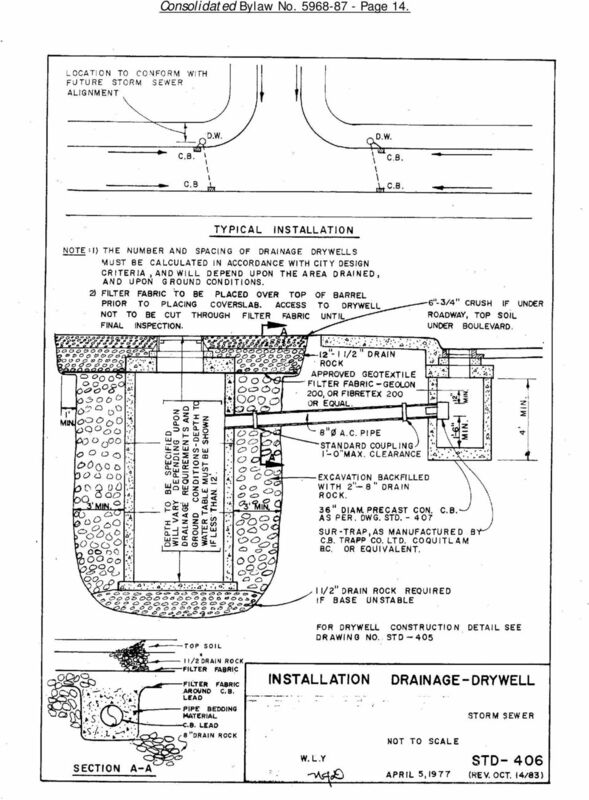 15 Amending Chapter 60 of the Code of Ordinances of Kansas City, Missouri, entitled Sewers and Sewage Disposal by adding Sections 60-349 through 60-360; and establishing an effective date.